A mature gorged female of Ixodes ricinus, the sheep tick or castor bean tick, ready to lay her eggs. Photo by Jarmo Holopainen. Ticks are probably the most familiar of all mite groups. Not only do they include by far the largest mite species but they also feed on the blood of vertebrates, a habit guaranteed to bring them to our attention. The ticks themselves would usually be more irritating than dangerous, except on occasions when they attack in large numbers, but many ticks are vectors of some very unpleasant diseases. 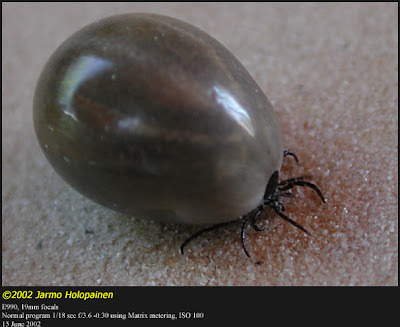 Ticks are classified into three families of which the largest is the Ixodidae or hard ticks with a little under 700 species (Horak et al., 2002). Hard ticks are distinguished from members of the Argasidae or soft ticks by the presence of a hardened scutum at the front of the dorsum (the third tick family contains a single species, the African Nuttalliella namaqua). In males the scutum can cover almost the entire dorsal surface while the female scutum is restricted to the front part of the body over the legs. Hard ticks also have the capitulum (the 'head') directed forward so that it is easily visible from above while soft ticks have the capitulum pointed downwards (Nicholson et al., 2009). A female of the cattle tick Rhipicephalus microplus laying her not inconsiderable brood of eggs. Photo from here. Cattle ticks removed from a single calf. Photo from here. The hard tick life cycle contains four stages of a single instar each - egg, larva, nymph and mature adult (soft ticks have multiple nymphal instars). Eggs are laid in large clusters of hundreds or thousands - the record number of eggs laid by a single female is 34,000 for a specimen of Amblyomma variegatum (Nicholson et al., 2009). Like other mites, larval ticks have only six legs when they first hatch out; the fourth pair doesn't appear until the nymphal stage. In both the larval and nymphal stages the young ticks will find a suitable host and feed then usually drop off and moult away from the host* (a small number of species don't leave the host before moulting and remain on a single host for their entire life). 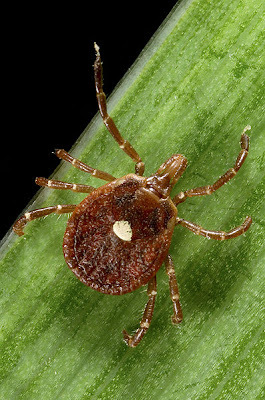 Some tick species are very choosy about their hosts (the best-known of which being the cattle tick, Rhipicephalus microplus [aka Boophilus microplus]) while others such as the sheep tick Ixodes ricinus are far more catholic. Some species feed on different hosts at different life stages. Even if suitable hosts are few and far between, some ticks can survive for over a year without feeding while they wait for one to turn up (some soft ticks can survive for several years without food). Males of Ixodes do not feed after reaching maturity and usually mate with females before they attach themselves to the final host (though some may mate on the host) while mature males of other ixodid genera do feed and copulation between the sexes takes place on the host (all together now - ewww). 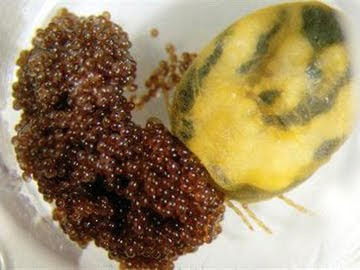 After copulation, the attached female gorges herself on her host's blood, swelling up to many times her original size. Once her eggs are mature, she drops off the host, lays her eggs in a suitable sheltered site, and dies (in contrast, female soft ticks can find another host and mate with another male, eventually surviving for several years). *I have to admit to being surprised when I learnt that ticks didn't just latch onto their final host right away, even though in retrospect it should have been bloody obvious. After all, they would hardly be as much concern as disease vectors if they only ever attacked a single individual. Back when she was skinny - a female lone star tick Amblyomma americanum sitting on vegetation waiting for a host. Photo by James Gathany. Phylogenetic analysis supports a basal division in Ixodidae between Ixodes and other genera which is consistent with the differences in life cycles between the two groups (Murrell et al., 2003). Horak, I. G., J.-L. Camicas & J. E. Keirans. 2002. The Argasidae, Ixodidae and Nuttalliellidae (Acari: Ixodida): a world list of valid tick names. Experimental and Applied Acarology 28: 27-54. Murrell, A., N. J. H. Campbell & S. C. Barker. 2003. The value of idiosyncratic markers and changes to conserved tRNA sequences from the mitochondrial genome of hard ticks (Acari: Ixodida: Ixodidae) for phylogenetic inference. Systematic Biology 52 (3): 296-310. Nicholson, W. L., D. E. Sonenshine, R. S. Lane & G. Uilenberg. 2009. 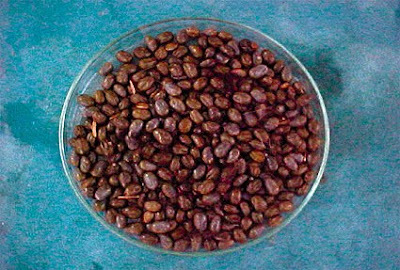 Ticks (Ixodida). In Medical and Veterinary Entomology, 2nd ed. (G. R. Mullen & L. A. Durden, eds) pp. 483-532. Academic Press.